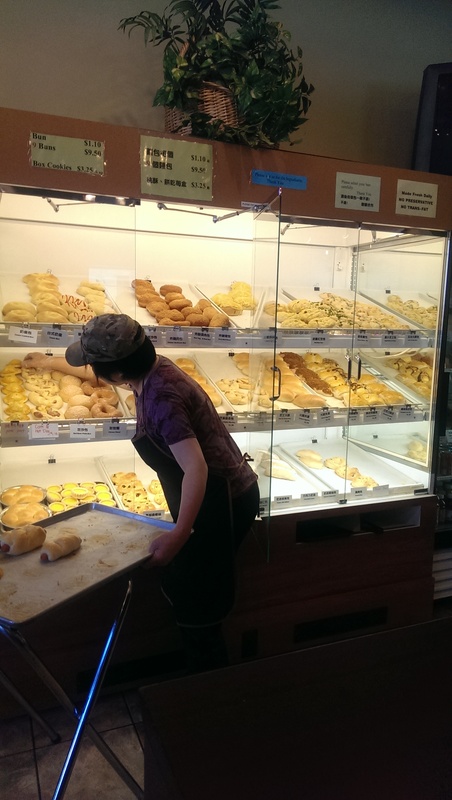 I’ve been frequenting Koko Bakery for a while now and have written about it during my dim sum crawls, but thought it might be nice to write a separate post about it. Koko Bakery is located in a small strip on Payne Avenue with Han Kabob Chinese Grill and Map of Thailand (and across the street from Seoul Hot Pot). The storefront is quite unassuming. One wouldn’t know by looking at it that it produces some amazing food and beverages. During a recent dinner at Map of Thailand I watched the people stream by heading for Koko. 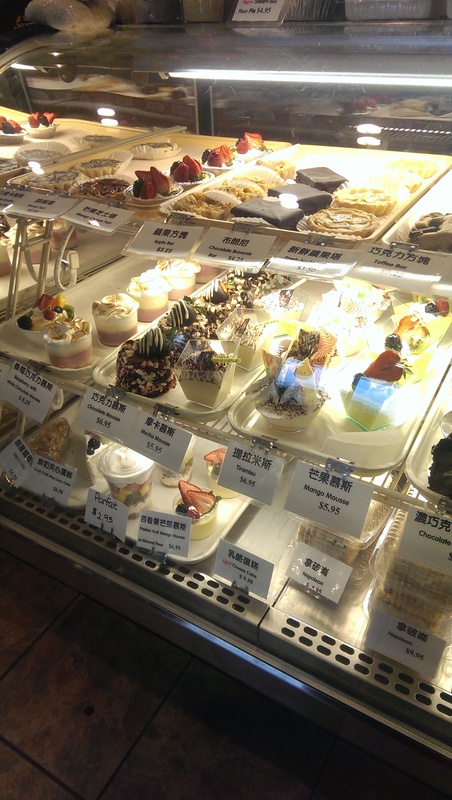 The Case Western Reserve University students on Yelp talk about how authentic it is and how it is exactly like bakeries you would find in Taiwan. Koko offers a wide variety of choices, ranging from savory to sweet. The case to your left as you walk in features hot dogs wrapped in pastry dough and the larger case next to it contains all kinds of buns, from green onion buns, pork buns, ham and egg buns, pineapple buns, buns with cut up hot dogs to egg tartlets and custard buns. There is a cooler and a freezer filled with buns to take home and finish baking yourself. My friend from Akron always stocks up with a ton of buns when he is up here. He then takes a bun or two out of the freezer and steams them for a quick and delicious meal. They sell all kinds of breads, cookies, buns, etc. to take home with you. The green tea cookies in a bookshelf on the right-hand wall near where you wait for your order caught my eye, and I am tempted to get them next time. The cooler cases flanking the cash register feature the most beautifully decorated cakes, tarts, mousses, and tiramisu. 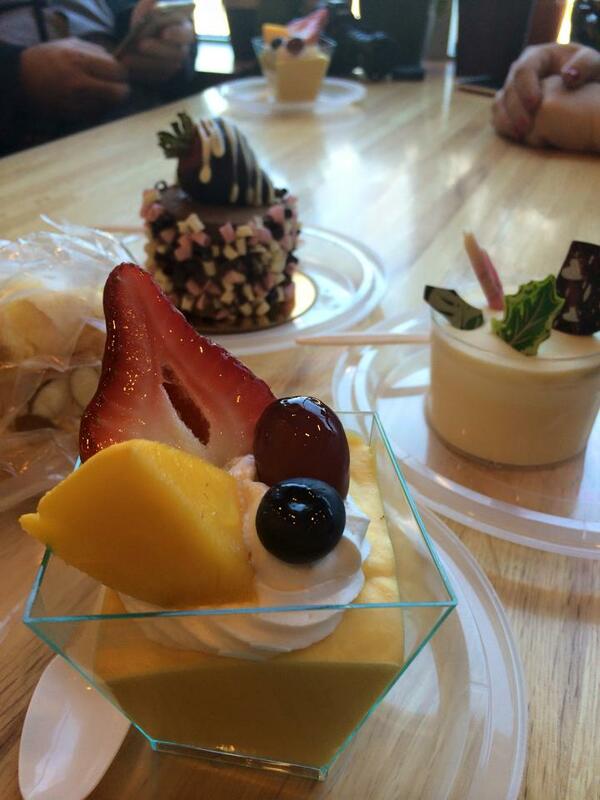 Every single one of them that I have tried – ranging from a chocolate mousse topped with a chocolate covered strawberry to the mango and passion fruit mousses and the mango cheesecake – has been delicious. Sufficiently creamy without being cloyingly sweet, the flavors hit all the right notes. The board behind the register lists a number of rice bowls, entrees like pork katsu or steam buns, and sandwiches as well as coffee, tea, milk pudding tea, smoothies, and their most popular item, the bubble tea. 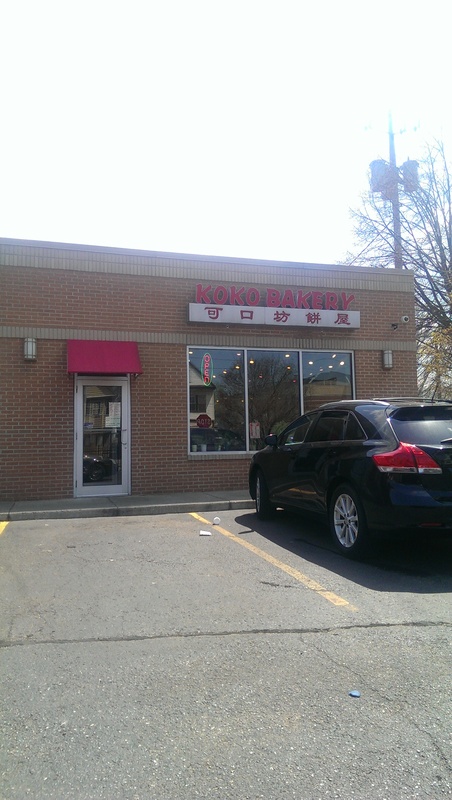 Several reviewers on Yelp have claimed that Koko has the best bubble tea in Cleveland. My first foray into the wonders of Koko started with the mango mousse. I got it to go and still have the neat container in my cupboard to use if I feel like fancying up a pudding. The mousse was light, airy and flavorful. 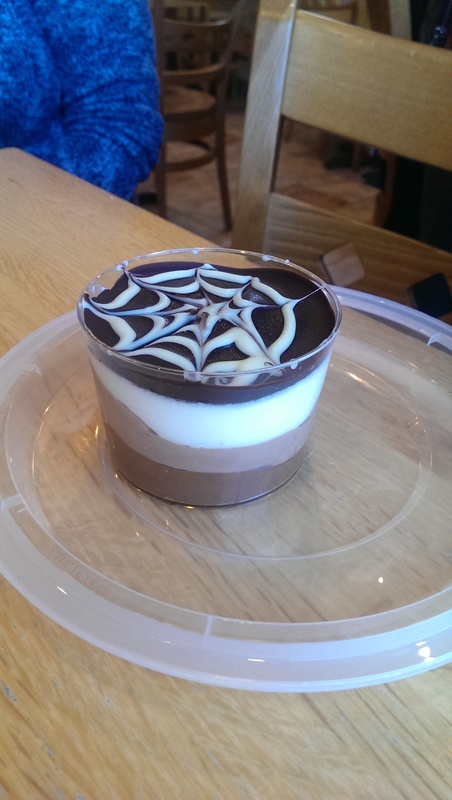 This mousse was delicious and I didn’t even miss the chocolate, which desserts usually have to contain in my world. I love the artful decoration of the fresh fruit atop the mousse. It looks whimsical but adds a nice artistic touch to an already amazing dessert. 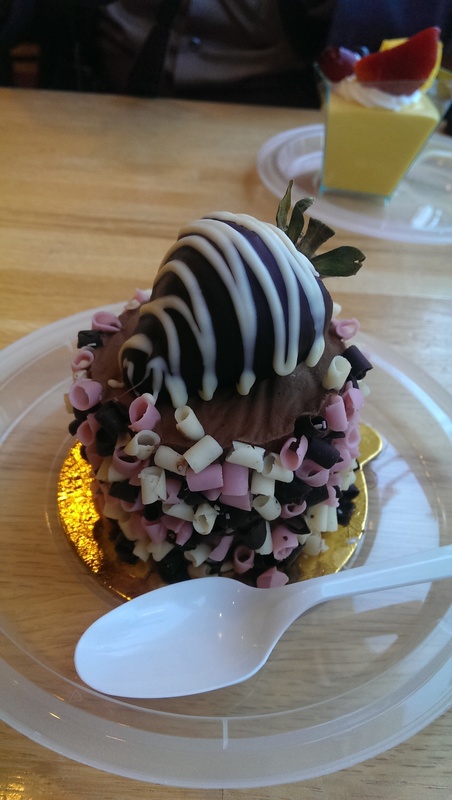 During part one of the dim sum crawl I was full and was considering just ordering a chocolate covered strawberry until the chocolate mousse topped with a chocolate covered strawberry caught my eye. The chocolate mousse was fluffy and delicious, the strawberry was perfectly ripe, and the chocolate coating was the perfect thickness to balance out the acidity of the strawberry. I also really liked the little chocolate curls adorning the sides. I ended up eating half and taking the other half home for later. One of my friends was less impressed with the passion fruit mousse. It was layered with a thick layer of white chocolate, which she doesn’t like, so it wasn’t as appreciated as it could have been. 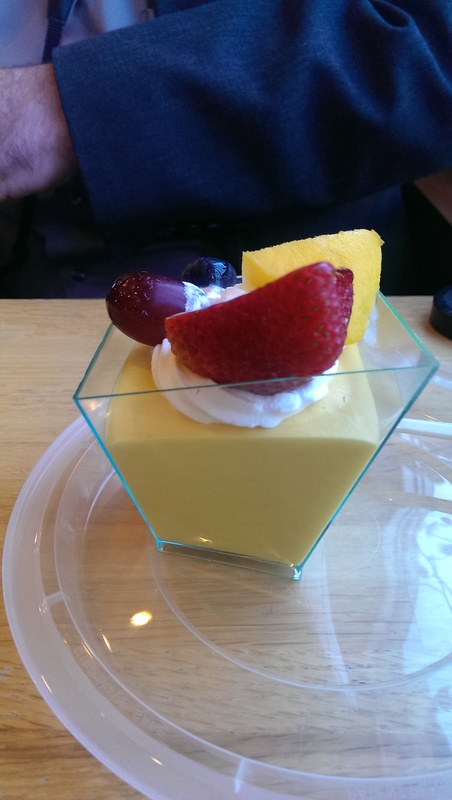 That said, the passion fruit mousse itself was absolutely delicious and she loved every bite of that part of it. Another friend ordered the triple chocolate mousse, while another ordered a green tea bun and another ordered an almond bun. Everyone walked away from Koko thoroughly impressed. Several friends who had only eaten at the first stop of the first dim sum crawl and were sad that they missed such beautiful desserts wanted to try it when they saw photos, so we stopped at Koko Bakery after part two of the crawl. 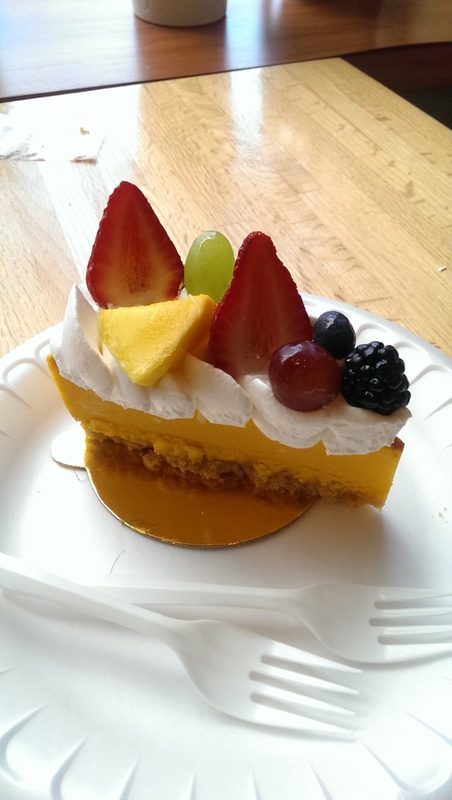 The couple split the mango cheesecake, which again was absolutely delicious and beautifully adorned with fresh fruit. However, it took forever to get the coffees they ordered because the people behind the counter seemed more concerned with making smoothies and bubble teas for the young Asian girls who came in after us. Meanwhile, I wanted something light after eating so many dumplings. I had noted during the previous stop that they served two different kinds of shaved ice – Taiwanese and Korean shaved ice. Since the Korean shaved ice mentioned ice cream I decided to try the Taiwanese shaved ice because I figured it would be lighter. The price includes 3 toppings of your choice, and you can add additional toppings for an additional $0.90. I stuck with 3 toppings and chose lychee, kiwi and mango. 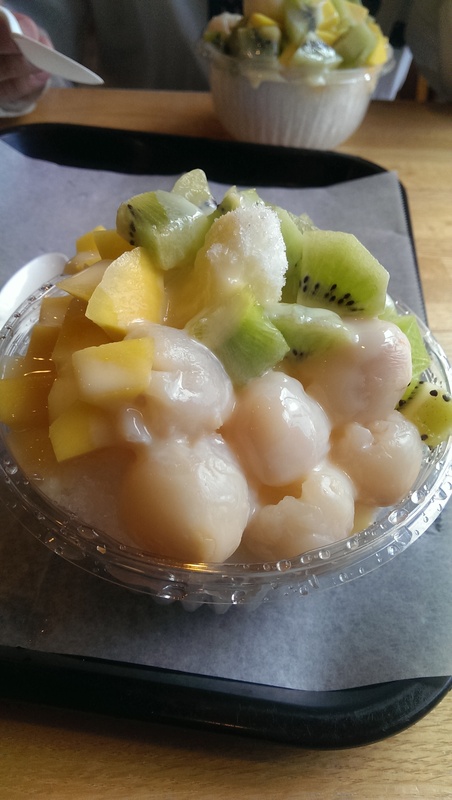 The ice is shaved, topped with fruit and then condensed milk is poured over it. It was actually really good. The fruit tasted fresh. The mango and kiwi were diced fairly small. As the ice melted down it mixed with the condensed milk. This dessert was extremely refreshing, and I can foresee myself coming here in this summer quite often to cool down.